Bravo Coy Expedition 2014, Pembrokeshire Coastal Path, Wales. Home > Expedition Reports > Bravo Coy Expedition 2014, Pembrokeshire Coastal Path, Wales. 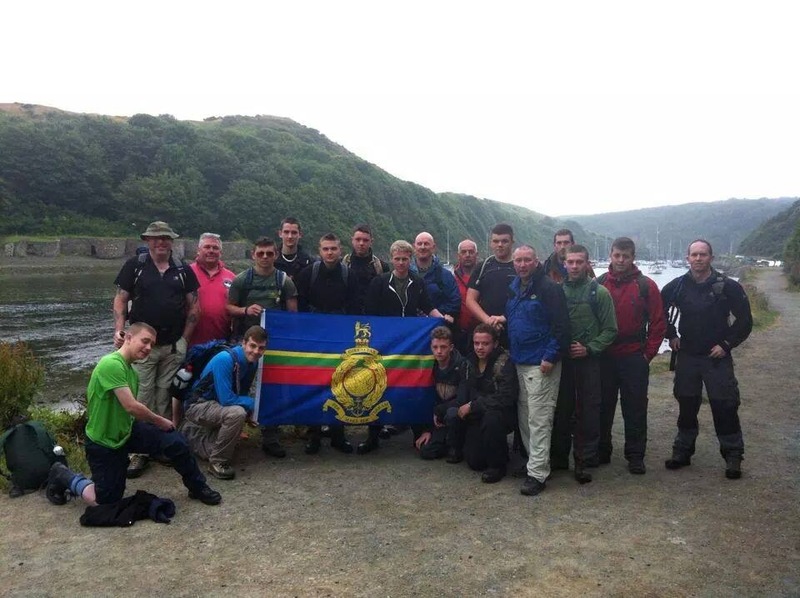 On the 11th June members of Bravo company’s expedition team set off to Pembrokeshire, Wales to walk a section of the coastal path, the team of 12 Cadets and 8 Staff plus Logistics team were kindly accommodated by Fishguard Sea cadet unit for the duration. On Saturday the 12th saw the team load their kit into the mini buses and make their way to the start point at Solva, thankfully the weather was kind to us with an overcast sky and slight sea breeze, perfect walking weather! We trekked over 25 miles of some of the most stunning coastline imaginable, the cadets and staff were treated to some of the local wildlife with Porpoise and Red Kites in abundance, what a fantastic first days walking! Some of the cadets and staff were looking threaders at the end of day one, admittedly none of us thought the coastal path was going to be as hard as it actually turned out to be, in fairness it was tougher than the expedition to Scotland last year! The morning of Sunday the 13th proved to be the day of the funny walks to the mini bus! Again we disembarked, strapped the Bergens on and cracked on with the coastal path, the staff noticed the silent determination on the cadets face’s and on we went. The day brought a mixture of cloud and sunshine but very warm, the weather was not so kind today, thankfully the loggie team made sure they met us at every opportunity so water bottles could be filled, the team once again smashed over 25 miles for the second day running and we reached our endex point in Fishguard around 1830, as a treat the CO of Fishguard SCC unit, Lt Sue Gittins RNR had arranged for us to spend the night at the local rugby club where we watched the World cup final with very tired legs and sore feet! Once again I am very proud of all the RM Cadets and staff, every year we arrange an expedition and every year they amaze me! This year we raised £715 FOR THE Ulysses Trust. Lt Glenn E MacLennan RMR, 2iC Bravo Company, Royal Marines Cadets.